Ok, let's just get this out there right off the bat. I had no clue that LG had so many incredible products coming out this year! And... I only knew that LG had phones so to see all the life changing products hitting the market - an eye opener to say the least! Let's just start with the sexiest - eh - prettiest of products for every household. I can give you the scientific explanation or I can give you the real mom meaning. Let's just put it out there.... A VACUUM CLEANER THAT CAN CLEAN THE HOUSE ITSELF! Yes! This vacuum functions by scanning the room with the eyes on the vacuum and then they know where to go & what to clean. The smart feature is called Home-Joy and it allows consumers to issue instructions to the vacuum by designating areas that need extra cleaning by usign the camera of a smartphone. Their trademarked 'triple eye' camera sensor records the area tracking where it already cleaned. All of this sounds incredible right? My question is - does it come with a cabana boy? ha. The Gizmo Gadget is the Gizmo Pal 'bigger sibling'. This is a product available with Verizon Wireless so swing into your local store to hear more! I am so in love with this new item I might CRY! ha. Actually, maybe not - but it's definitely a life saver for many moms out there! And potentially after ours just crashed while I was in Vegas - I might really be thinking about buying one of these. Get this. A washing machine that can clean 2 loads at once AND it comes with a remote control!!! INSANITY I tell ya! My fave is the washer by far. But to know that they do so many other things outside of phones & TV's I'm dying to learn more about the brand! What is your dream LG product? This is a sponsored post by Living in Digital Times & LG at the Consumer Electronics Show. k, I can't keep a secret at all! I know you all are DYING to know about my wild and crazy bright phone case, right? I LOVE THIS CASE! All in the name of vanity, yes, but at the end of the day - it's just BRIGHTER! Everyone needs to share the light in this world, right? Grab one now on Amazon! What is #RealityMoms? Learn more about our story at www.RealityMoms.tv! 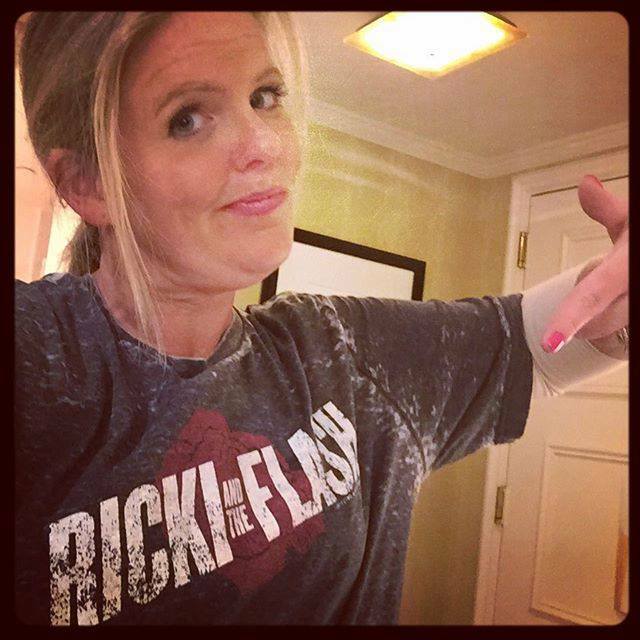 This past weekend I got a last minute random invite to attend a junket for a new movie called Ricki & the Flash! I was actually in my hometown visiting with my family when I got the invite. And for the 1st time in forever - I actually was invited to do something non-blogger bash related! lol It was something I LOVED to do when on air. MOVIE JUNKETS! And even though I said I was trying to SLOW DOWN (and yes, my husband made it TOTALLY clear to me that I was not slowing down yet! haha) I couldn't pass up the chance to meet Rick Springfield. Upon arrival to NYC I met up with a few of my favorite blogging buddies and we headed over to the Sony offices to catch the movie before we interviewed the stars. . I can't really even begin to tell you what it felt like sitting in that theatre. It was REALLY surreal. I mean, think about how many movie stars sat in those seats? I was nervous that I would get in trouble for taking pics or interrupting the movie!! I know, right. So silly. But I didn't take a pic OF the screen. Just one of me FACING the screen. We got treated to a lovely makeup experience along with some great treats before heading out to dinner. I got my eyelashes put on - which I am officially obsessed with, thank you Kim Pirella my former NickMomCoHost! The pic was before the lashes -------> But by the time I got done and we went to dinner at a BBQ joint, I forgot to take a pic! Then eating BBQ? All bets were off. ha. Either way, it was super fun to hang out and get our makeup, lashes & hair done. Ricki & the Flash coming to theaters August 7th! Check back for Minutes with Meryl & Motherhood. But also, a song. One called 'Mom'. For a man who has made his mark in music on a big scale, Garth Brooks will forever be a family name in our house. Obviously with selling over 134 million albums-he's a family name in many houses! In my radio days - my first job was for a country station in Kentucky. I remember getting to go to a concert with my mom and how excited she was to see the show. I took my mom to check out LeeAnn Womack. It was in 2000 when I Hope You Dance rocked the charts. I remember it just like it was yesterday. It was really my moms first concert and she was so cute about it! She said to LeeAnn 'next time you're in St. Louis - come over for biscuits and gravy!' And of course LeeAnn knew my moms name and called her Ida. Everything about that experience with my mom was just dreamy. It was a time in my life when my college boyfriend dumped me so my mama being around was all I cared about! She came and visited me often that year. It really warms my heart thinking about it. This was actually the first and ONLY concert my mom has ever been to. Wouldn't it be great to take her to see & meet Garth? Hmmmm. In fact. What I wouldn't do to take my mom backstage to meet Garth in CONCERT!!! Yep, for a man who has said he retired-he sure returns a lot! ha. Brilliant biz move on his end. But yes, Garth has a new album with an AWESOME new single called "MOM"! The album drop goes hand in hand with his partnership with GhostTunes, a new music site. AND HE'S TOURING AGAIN! Ok, back to the MOM part. So, his new single "Mom" has such a beautiful story to it. And in honor of his new single - he's doing a cool concert with YOUR MOM!! Huh? Yeah! Well sort of. MAYBE! You could be enjoying a concert with YOUR MOM! He's giving away one lucky winner and their mom an experience to travel to a Garth Show! In celebration of Garth Brooks brand new single, he's partnered with GhostTunes and one lucky mom and guest will win the opportunity to see Garth in concert complete with hotel and airfare! So share, sign up, register, scream from the mountain tops and above all SIGN UP FOR GHOSTTUNES AND DOWNLOAD HIS ALBUM TO ENJOY MOM! GhostTunes is the only place you can get it! Find GhostTunes on Facebook, Twitter, Instagram & more! Have you ever been to a Garth Show? What is your favorite Garth song? OH... AND FOR AN EXTRA SPECIAL TREAT - CHECK OUT GARTH WHEN HE HIT THE STAGE WITH JUSTIN TIMBERLAKE IN NASHVILLE THIS MONTH! SWEET! DISCLOSURE: Compensation was provided by GhostTunes via MomTrends. The opinions expressed herein are those of the author and are not indicative of the opinions of Ghost Tunes or MomTrends.